The Return to Ravnica block is dead, long live Return to Ravnica. With the rotation of M14, RTR, Gatecrash, and Dragon’s Maze, control in the standard format has become downright anorexic. Gone are the days of uncounterable board wipes, overloaded tempo spells, and cheap removal like Doom Blade. We are now in a time of board threats that can only be handled with similar threats. We’re talking bloody, knuckle to knuckle, no holds barred coliseum gladiator battles. There will be some good removal spells, but they’ll be a lot less effective than our last standard meta. Today I’ll be talking about spot removal, board wipes, burn, tempo, enchantments, and anything else that can act as removal in the current metagame. We are at our lowest amount of cards in standard at the moment, so as Fate Reforged and the following sets come out, you’ll have to add those new removal spells into the mix. That’s still 3 months away though, so we have some time to get acquainted to the new way of things. After only a week of Khans standard, these are my choice for best removal in standard. Sadly, our new best board wipe is a lot worse than Supreme Verdict from the last set. In a pure control deck it won’t be played until turn 5, and it can easily be countered if an opponent is playing blue in their deck. 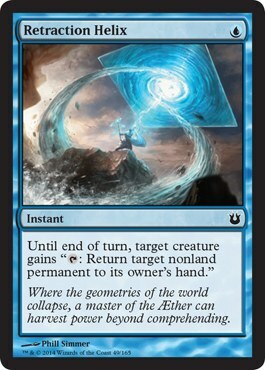 The double white mana symbol also means its more difficult to splash, especially in this era of Wedge colors. However, it kills everything and that’s all that really matters, right? This will become the bread and butter of control decks in the coming months, so if you fashion yourself a control player, you should probably pick up a playset now while you can. They are still rather cheap. We could see a Jeskai control deck sometime in the near future, but I realistically think that control won’t pick up until Fate Reforged in January next year. Anger of the gods should be the most effective card in your arsenal against aggressive aggro decks, but but they will otherwise be worthless in all other match ups such as against green midrange. Fated Retribution saw some play in UW and Esper control decks before the rotation, and it might see some more play alongside End Hostilities in the next white/x control deck. Instant speed wrath of gods are pretty sweet, but 7 mana with triple white are not. Realistically, I don’t see Duneblast seeing any play at all, but the last 2 COULD be playable in the right decks. If a new Black/x devotion deck takes form that has access to Nykthos, Shrine to Nyx, In Garruk’s Wake could see some play, but it’s highly unlikely. The same with Extinguish All Hope in some sort of a Enchantment creature deck. They are simply too narrow of cards and cost way too much. Drown in Sorrow should see a lot of play in sideboards though. It’s much better to use against aggro decks if you’re playing G/x than Anger of the Gods because Sylvan Caryatid can live through it. Just in cast you forgot, spot removal is a card that destroys or exiles a target without any drawbacks. Sometimes you don’t want to wipe the board, sometimes you just need to kill one thing and make sure it stays dead. 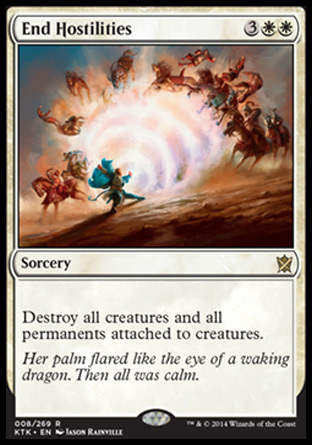 The premier spot removal for Khans of Tarkir standard is going to be Hero’s Downfall. It kills any creature and any planeswalker you ask it to for a mere 3 mana. Sure we had Doom Blade and Dreadbore in the previous standard metagame, but no more. 3 mana is now the lowest you can pay in order to destroy anything you want. The double black makes it hard to splash in some decks, but with painlands and cards like Sylvan Caryatid, green shouldn’t have a problem. Utter End is our new Vindicate of sorts. It will exile anything you want but the draw back is paying 4 mana with at least one white mana and one black. It won’t be that good against aggro decks, but it should be great against other midrange decks since it can act like an extra Hero’s Downfall. The great thing about it is that Utter End can also take out a Banishing Light or other enchantment such as Whip of Erebos in reanimator match ups. If the metagame slows down and midrange/control decks take over, this card could really take off. Not only is it great in Abzan midrange, but I could also see it doing well in a Mardu control deck or even a straight BW control deck. This card could end up being a sleeper hit. That’s a pretty large list of spot removal, but each one is not without its demerits. Abzan Charm is good against midrange decks with big creatures, Sultai Charm hits only mono colored creatures, and Bile Blight only hits creatures with the same name for -3/-3. Setessan Tactics on the other hand, can kind of be considered a semi-board wipe depending on your situation. It’s good in green devotion decks that have access to zero removal, but outside of that I think there are better choices in the other colors. Silence the Believers is a slightly worse Utter End, but in it’s defense being able to exile 2 creatures for 7 mana, or 3 for 10 isn’t bad in a long game. But it also targets only creatures. Murderous Cut is another strong contender for break out card of the set, but right now it seems like it would only be good in a control deck that is countering/killing a lot of things and filling up the graveyard quickly in order to use that card efficiently. Devouring Light makes you wait for a creature to attack/block, but that’s not so bad I guess. There are also quite a lot of good sideboard removal cards in standard now. Feast of Dreams for enchantment creature heavy decks, Hunt the Hunter for green match ups, Deicide for gods and other enchantments, Dark Betrayal for black decks, Pharika’s Cure for aggro, Reprisal for midrange . . . depending on the metagame, you should always be able to find an answer for a card. I think green also has some decent removal now, though it’s not like they need it. Savage Punch is cheap enough to see some play I think. Ulcerate is also a fine card due to how cheap it is to cast, but the -3 life clause can be hard to swallow. Red/white burn decks lost A LOT of good cards to the rotation and I’m pretty sure we won’t see another burn deck for a while. That’s not to say that we don’t have any good burn spells, but we definitely don’t have enough efficient ones to make the strategy viable again any time soon. Anyways, lets take a look at what’s left in standard after the rotation. 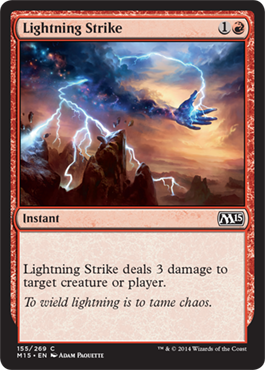 Lightning Strike gets my vote for the most efficient burn spell again. It’s going to be a 4 of in most control/burn based strategies. 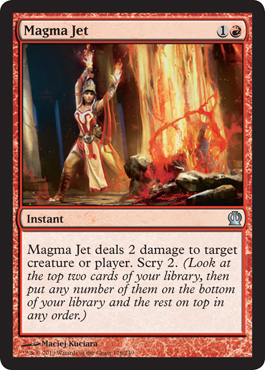 Magma Jet didn’t get more powerful, but I think it got more useful in this metagame. The scry 2 is more important now than ever. Although the 2 damage won’t be killing that many creatures in standard, being able to set up your next 2 draws will be pretty good. Just like with the spot removal, burn has a lot of choices this time around. Stoke the Flames should continue to prove its worth in standard, and will be simply amazing in token strategies. Shrapnel Blast might need an Ornithopter, Scuttling Doom Engine, or Darksteel Citadel to work well, but 5 damage for 2 mana is a hell of a lot. With the onset of bigger creatures, Searing Blood has lost some of its luster, but I think it should still serve as a good sideboard card in Mardu burn decks. Other sideboard cards inclue Magma Spray, which is a good way to deal with fast decks like mono black aggro and also kills mana creatures efficiently and Fated Conflagration to kill a Sarkhan the Dragonspeaker or Elspeth, Sun’s Champion. Khans has given us some pretty good burn spells too. Crater’s Claws has been performing very well in Temur aggro and GR ramp decks so far, and Crackling Doom is a midrange player’s worst enemy when they spend their first few turns playing mana creatures to push out an early monster only to take 2 damage to the face and have to sacrifice it. Arc Lightning I’m not so sure of right now though. In an aggro heavy meta it should be fine, but I don’t think we’ll see a lot of aggro after the pro tour in Hawaii. Tempo is another one of those strategies that people don’t quite understand. Tempo cards don’t kill, but rather they slow a player down by either tapping a creature, returning it to their hand, or putting it somewhere on their library. These are the cards you play when you want to push damage through quickly and not have to worry about an opponent’s creatures. Most of these cards are blue. The tempo card of the hour is currently retraction helix. Why? Because it’s involved in the Jeskai combo deck along with a few other Jeskai Ascendancy strategies that are all about playing tons of spells and then killing an opponent with cards like Altar of the Brood or attacking with a gigantic creature thanks to the enchantment itself. These can basically win on turn 4 if you can’t stop the combo. Aside from Retraction Helix, the only other cards I see getting any type of standard play are Aetherspouts and Polymorphist’s Jest. Both cards can be incredibly powerful when creatures are attacking you and totally shift the tempo when cast. Blue mages are probably going to stick to their counterspells and pass on these cards, but don’t count them out. The first few weeks of any metagame are hard to analyze, and anything could happen. 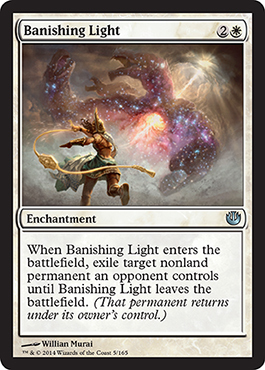 With the loss of Detention Sphere, the responsibility of exiling permanents falls solely on Banishing Light now. 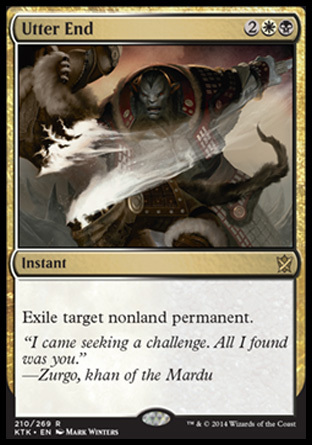 Luckily it’s easily splashed in any white deck, so I think we’ll see a lot of this in the Khans metagame. Courser of Kruphix is a given in the new standard. We will see a lot of it over the next few months, but it won’t be the only enchantment out there. You’ll need some sort of removal, and while I think Reclamation gives you the best value (a creature and a removal spell), Back to Nature can wipe a board if all they have is Courser of Kruphix and Banishing Light on the battlefield, which means it can be a 2 for 1, if not more. Chained to the Rocks is a great removal spell, but you pretty much have to run straight Boros colors for it to be effective. Fetch lands make it easier to grab mountains, but I think you still might have problem casting it. Circle of Flame has been touted as a good sideboard card for mono black and other aggro decks using Goblin Rabblemaster, and it definitely performs well against both of those decks. Singing Bell Strike is somewhat of an upgraded Oppressive Rays which gives you an advantage in the early game if you can tap your opponent’s creature and then attack without being blocked. Sultai Charm is just a sweet card all around. Along with the “kill a mono colored creature” claus, you can also destroy an enchantment. It’s Ultimate Price/Naturalize in one! The other new enchantment from Khans of Tarkir that might see some play is Suspension Field. It won’t stop a Goblin Rabblemaster, but it should take out a Courser of Kruphix no problem. Black seems to still hold the best removal out of all of the colors, but it seems a lot more balanced than Theros block. I’d expect midrange decks to benefit the most from this rebalancing of power, and control decks to lose the most since they don’t have as many effective sweepers/board wipes. While a straight burn deck is also unrealistic at the point in standard, you still have to respect it. A deck with 4 Magma Jet, Lightning Strike, and Stoke the Flames can still end you by turn 5 if you’re not careful, especially in a good aggro deck. Crater’s Claws has also proven itself to me. The card is great in GR/x decks that can ramp into a lot of mana and also play big creatures. The metagame will solidify somewhat in the next few weeks after some Grand Prix and the Pro Tour, but I am pretty confident that the cards I talked about today will see a lot of play before January. If you have any other suggestions you’d like to make or add comments about a card I mentioned, please feel free to post them down below. Thanks again for reading! Great articles, every single one of em. Loving your site.